The recent film ‘The Railway Man’ tells the story of Eric Lomax, a British soldier captured by the Japanese in World War 2 and held in Changi Prison before being sent to work on the infamous Burma railway. As well as thousands of soldiers, around 3,000 civilians were incarcerated in Changi, including Somervillian Dr. Cicely Williams. One of the first women to be admitted to degrees in 1920, she completed her medical training at Kings College Hospital in London and went on to specialize in paediatrics and nutrition, working for the colonial medical service on the Gold Coast and in Malaya. A proponent of breast feeding, she was an early critic of companies marketing tinned alternatives in developing countries (her talk ‘Milk and Murder’ to the Singapore Rotary Club predated the first international code on such practices by 40 years). Captured after the fall of Singapore in February 1942, she was incarcerated in Changi Prison for most of the war, with five months spent under arrest as a suspected spy, during which she was imprisoned by the Kempeitai (secret police) in a series of cramped and insanitary shared cages. In Changi, her skills and expertise were invaluable; she later recalled “twenty babies were born, 20 breast fed and 20 survived – you can’t do better than that.” As well as doctor and dietician, she later became commandant of the women’s camp. 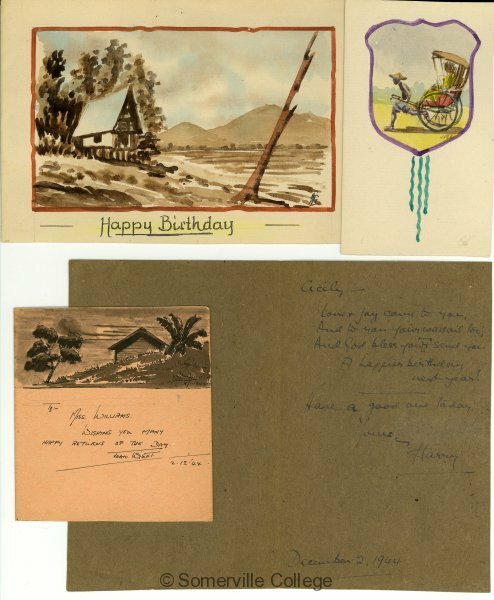 These birthday cards were given to her by her fellow prisoners in 1944 and are now deposited in the Somerville College Archives, testimony to an extraordinary woman, to her strength and resilience and to that of her fellow prisoners. This entry was posted in Somervillians. Bookmark the permalink.